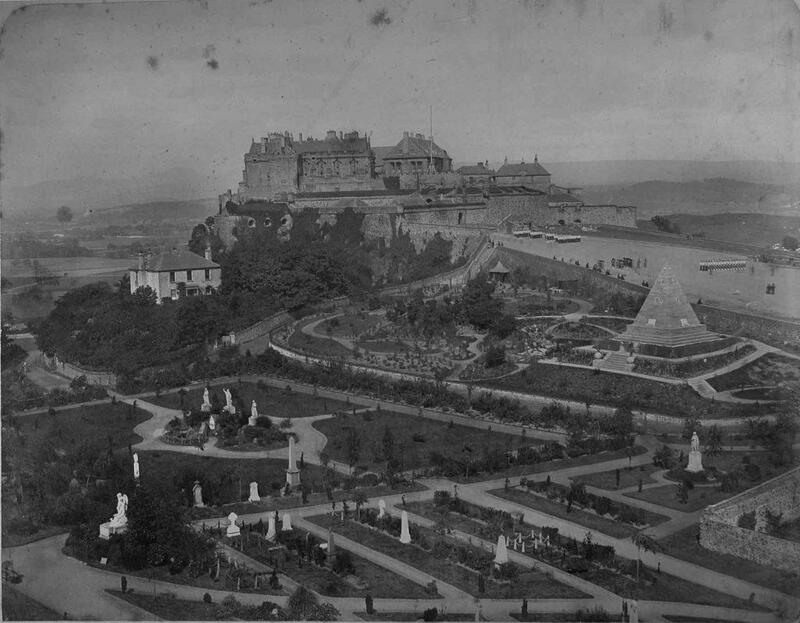 This photograph, taken by Stirling photographer Alexander Crowe, shows the cemetery in its early years. The layout was completed in 1857 and the first burial took place then. The scheme was devised by Charles Rogers, promoter of the Wallace Monument and financed by seedsman William Drummond. ‘The Valley’ was a rough place for horse fairs, gambling and crime. Working with Isaiah chapter 40, ‘Prepare the way of the Lord and make straight in the desert a highway for our God’ the promoters turned the Valley into an instruction manual on the Bible and the reformed Church of Scotland. The pyramid represents the Old Testament. The spring water trickles from it to a pool in front of statues of three founders of the Church of Scotland: John Knox, Andrew Melville and Alexander Henderson. To the right is the statue of the Reverend James Guthrie, who was martyred in 1661 for his beliefs. On the left is the white marble grouping of the Virgin Martyrs, drowned in Solway in 1685 during the ‘Killing Times’. The group, by sculptor Handyside Ritchie, was installed in 1859. In 1867 it was covered by the protective iron canopy, made in the Sun Foundry, Glasgow. The absence of the canopy dates the photograph to this 7-year period. ‘The Valley’ remains one of the great instructive walks available in Stirling.